Ballybunion or Ballybunnion (Irish: Baile an Bhuinneánaigh) is a coastal town and seaside resort in County Kerry, Ireland. 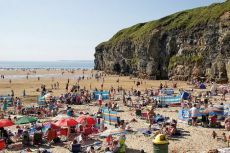 In the summer, Ballybunion attracts many families and young people to enjoy the sandy beach, warm Atlantic waters and the pubs along the high street. Nearby cliffs offer excellent scenery. Sometimes dolphins may be seen in the waters. The beaches near Ballybunion are a popular surfing site. Other traditions include the beachside Seaweed Baths, featuring sea water with kelp. In the summertime cooked periwinkles are salted and served in small paper bags along with a pin to extract the small sea snails. The village itself contains mostly pubs and amusement arcades, fast food restaurants, children's playground, a supermarket, Garda Station and a statue commemorating the golfing visit of Bill Clinton. This was the first statue of Bill Clinton on public display in the world; it is located on the corner of Main Street and Church Road. At Easter & Summer we run Surf Summer Camps. We also cater to School Tours, ensuring your class have a day out they'll remember for years! So why not call down and experience the thrill of that first wave in safe and encouraging surroundings at Ballybunion surf School.